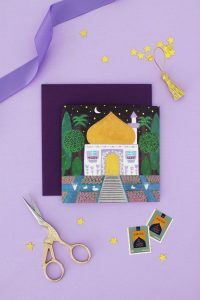 Henna Hands Greeting Cards – Hello Holy Days! For some Muslim cultures, henna, or mehndi, is a big part of Eid celebrations. The night before Eid women and children get intricate henna designs on their hands so on Eid day their hands are stained with a fresh, dark espresso colour. If you’ve got a little one, make these henna hand greeting cards to engage her (or him!) in this age old Eid tradition with a North American twist. They’re great for handing out to family, friends or teachers – and for added fun, consider combining the cards with candy or treats. Place hand with fingers widespread on cardstock, trace with pencil and cut out using scissors. Add designs using floral or arabesque stamps and stamping pad.